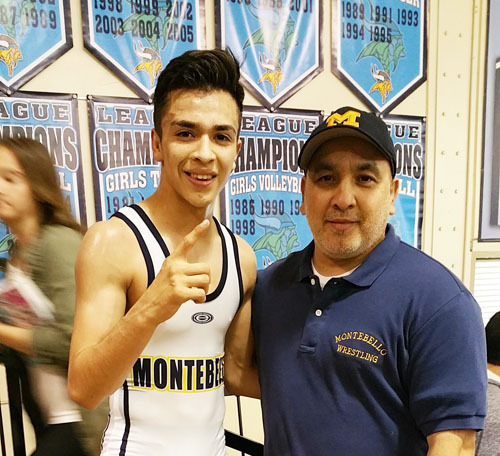 A Montebello Highs School athlete coached by his father, has turned wrestling into a family tradition, a championship one at that. Nichols “Nico” Gomez became Montebello’s first-ever two-time Southern Section California Interscholastic Federation (CIF) 106 lb. Division wrestling champion, clinching the title in February under the watchful and supportive eye of his father, Pete Gomez, who also wrestled at Montebello High School and now serves as the school’s assistant wrestling coach. “There is no better example of Montebello school pride than a son following in his father’s footsteps, with both personifying dedication, hard work and purpose,” Montebello Unified Board President Edgar Cisneros said. Nico claimed his first championship in 2014 as a junior. This year, he helped Montebello earn a share of the Almont League title for the first time in 17 years. “It’s a dream come true,” Nico said. Nico’s father Paul wrestled at Montebello from 1984 to 1988. Nico stared wrestling in 6th grade but his passion “was always football,” according to his father. That’s when the elder Gomez returned to his alma mater to serve as assistant coach under newly arrived head coach Robert Ferra. In four short years, the two have helped turn Montebello into a Southern Section contender. Nico’s dedication paid off and this year he found himself at the CIF championships, where he won the title on February 21. He also qualified and participated in the State Championships in Bakersfield earlier this month.